How does one define Mimmo Cozzolino, the extraordinary young man responsible for this book? He's not really the author, yet he's far more than an editor. I think I'll settle for a Trade Marxist. Consider the eerie parallels... while Mimmo was born at Herculaneum in 1949, within the shadow of Vesuvius, I was born here, in 1939, within the shadow of the Dandenongs. Well, within a 60-minute drive. Mimmo spent his childhood at the Herculaneum diggings, peeking under the black curtains at the graffiti of a mythic figure with an enormous phallus. Meanwhile, he studied Latin. I spent my childhood at the Kew tip, searching through the layers of refuse for interesting artifacts. Such as Mickey Mouse mantels, old car batteries and Marchant's lemonade bottles which were worth threepence at the milk bar. Meanwhile, I studied Latin. These days, I frequently dart off to Italy where I snuffle into the Tuscan topsoil in the hope of finding the broken shards of an Etruscan chamber pot. In fascinating juxtaposition, Mimmo has established himself as the leading archaeologist of Australian advertising, and is frequently seen peeling the lino from old kitchen floors, in the hope of discovering some yellowed newspaper that, in turn, will yield an undiscovered Abo brandname. It is well known that every intelligent, educated person with a refined sensibility despises and detests advertising, regarding all who toil for Mammon as the moral equivalents of used-car salesmen and the social equals of lepers. Yet old advertising is different. Already 1960s TV commercials have lost their commercial sting, metamorphosising into the iconography of nostalgia. Like popular songs, faded photographs and old Boomerang Songsters, they give us a sense of our past, reminding us of what went on beneath the newspaper headlines and the epic concerns of academic historians. Like Carter at the tomb of Tut, Mimmo takes us into forgotten times. And as he blows the dust from his invaluable collection of engravings and scraper-boards, the counterpart to Tut's priceless jetsam, our earliest tycoons and financial pharaohs live again. Australians are very embarrassed about patriotism. Amongst most of my Labor voting colleagues, it's been renounced since the Kerr coup. Yet I defy any Oztralian to turn Mimmo's pages without feeling the goose bumps (if not the goose steps) of nationalism. True, many of the symbols are racist or involve appalling puns. Yet somehow they seem infinitely preferable to those of the 1980s where the overwhelming majority of brands on our TV screens or supermarket shelves are alien. Or to be more specific, American. To hell with Colonel Sanders - give me Ballarat Bertie any time. And I'd love to see Mimmo's gun-toting kangaroo give Mickey Mouse, Esso's tiger and Uniroyal's steel cat their marching orders. But enough of this tub thumping. Let me tell you about Mimmo. Twenty years ago, his parents decided to migrate to Argentina, only to discover that immigration to that country had been cancelled. They subsequently chose Australia because it was 'the second furtherest place to migrate to'. On arrival at Port Melbourne, they were immediately plonked in a cattle train to Bonegilla migrant camp where they suffered from both AC and DC culture shock. It seems the camp was run by a German who'd learnt to strut his stuff with the SS. Mimmo spent the next five years trying to learn English which he describes as 'a funny language'. His father, a printer by trade, is still trying. To the general dismay of parents, relatives and teachers, Mimmo enrolled at Prahran College, studying art and design. In his final year he picked up a $1000 prize for winning the Australian section of an international Sugar Mark competition. Thus began his commitment to Trade Marxism. I first met Mimmo when he was in partnership with a young Greek named Con Aslanis. Their company was called 'All Australian Graffiti' and was motived by 'a mad desire by two crazy wogs to prove themselves in a WASP industry.' In the past immigrants like William Dampier and James Cook had discovered Australia. In the early 197Os, Mimmo and Con discovered it all over again. 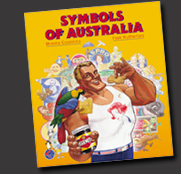 In Symbols of Australia Mimmo confronts Australians with a host of ancient hieroglyphs which, I think, add weight to my hypothesis that this nation was founded by ancient Egyptians who dropped off on their way to South America. (In South America they were known as the Aztecs: here, the Anzacs.) Their arrival, in small craft, is celebrated each year in the Henley Regatta on the Yarra, which earned its name from the ceremonial cry of the Anzacs ... 'Yea! Ra!'. This ritual would have been observed by the high priest standing on the steps of their pyramid, the Shrine of Remembrance, so reminiscent of Cheops, soaring above the Nile. Rather than directing you to specific hieroglyphs, I will let you enjoy a voyage of discovery. And if you're feeling hot and sweaty by page 141, fear not - you'll be rejuvenated by that aromatic shandy (the quintessence of prickly pear) Eau de Queensland.